By default, Outlook Express will show the Folder List pane on the left side of its main window, which displays the five standard folders ("Inbox", "Outbox", "Sent Items", "Deleted Items", and "Drafts") and any custom email folders you have created yourself. Since this pane can be hidden, Outlook Express has to give you other options to access and open hidden folders (and it does, as you'll learn in this tutorial). We'll also show you how to show or hide folders and subfolders - unlike email programs like Microsoft Outlook or Mozilla Thunderbird, Outlook Express doesn't include a functionality like "favorite folders", which lets you quickly access most commonly used folders - we'll explain a couple of ways around that limitation. Once inside Outlook Express, let's first assume that you have the Folder List displayed on the left: in that case, the easiest way to open a folder is to simply click on it, but you can also right-click on an email folder other than the one currently selected, and choose "Open" from the context menu that appears. But what if your folders are hidden? No problem: click on the View menu from the main Outlook Express window, and select "Go to Folder": Outlook Express will open the corresponding dialog, from which you can double-click on any folder to open it (or select the folder in the listing, and click on the OK button). You can even type the first few letters of the folder name, and hit Enter to open it. Outlook Express Tip: even if you cannot see your folders, just press the Ctrl+Y keyboard shortcut on your keyboard, and your email program will show the Go to Folder dialog, and let you choose the email folder you want to open. How do I know which email folder is currently open? Second, if the Folder Bar is visible (it is by default), you can just look at it, since it displays the name of the folder currently selected, and is always automatically updated when you switch to another email folder. Finally, if both Folder List and Folder Bar are hidden, you can just press Ctrl+Y to bring up the Go to Folder dialog, and the current folder will be highlighted in that listing (then press Esc to hide that dialog). Note that to expand or collapse folders and their content, you need to have the Folder List currently displayed in Outlook Express; if you cannot see your listing of folders on the left, learn how to show the Folder List in just a few clicks. Notice that some folders have a "+" plus sign button next to them, others show a "-" minus sign, and other email folders or subfolders have neither. This is Outlook Express' way of telling you that folders with a +/- sign button next to them contain other folders; if a minus sign is showing, it means that their subfolders are now visible, and that clicking on "-" will hide all their subfolders and sub-subfolders (if any). Likewise, an otherwise regular-looking folder flanked by a "+" sign means that you can click on it to show the subfolders it contains. Tip: when the focus is on the folder listing, you can also use the Up, Down, Left, and Right arrow keys on your keyboard to move up or down, and expand or collapse the selected email folder. 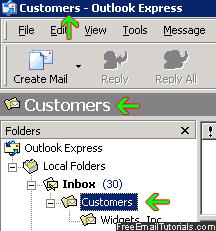 Clicking on such a small expand/collapse button combo to show or hide your email folders and subfolders can be quite tedious, so Outlook Express offers an alternate way: simply double-click on a folder, and it will toggle the visibility of the folders it contains. The same double-click will show or hide the subfolders, as applicable. Note: that same visual convention is used throughout Outlook Express; the "Go to Folder" dialog under the View menu also uses plus/minus sign buttons to show or hide subfolders; as does the "Move to Folder" dialog, "Copy to Folder", etc.